Dubai, United Arab Emirates, June 14, 2018: Splash, UAE’s largest fast-fashion retailer has launched ‘Life After Fashion’ an initiative as a means of progressing their sustainable practices by giving back to the less fortunate. The initiative involves a close collaboration with neighbourhood laundries which collect unwanted clothing items which are then recycled and distributed by Hands Industries, a modern textile recycler and exporter of second hand clothing. The UAE has become one of the world’s largest retail hubs, where fashion trends are current, and constantly evolving. This rapidly developing fashion sector has, however, made fashion highly disposable for a substantial portion of the population and used clothing items often find their ways to landfills instead of being donated to those who would benefit from them. Splash, found a way to not only adopt a more sustainable practice of clothing donation, but also found an effective means of encouraging the public to do so in a manner convenient to them. It all hangs on a hanger. Neighbourhood laundries have been encouraged to deliver clothes hangers to their customers that are creatively customized with faces of people in need of donated clothes. 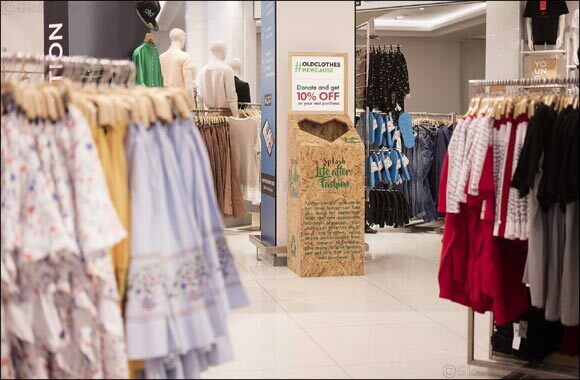 The hangers act as a visual reminder, incentivising customers to donate their unwanted clothes which are then picked up by the laundry. The redesigned clothes hanger acts as a powerful, silent ambassador allowing the public to reflect and then put into process their clothing donation. The campaign, having run for three months has already resulted in the collection of eight tonnes of donated clothes which are being distributed in a variety of ways. Hands Industries categorises them into provision for used clothing markets, donation to African countries or for recycling purposes. The initiative will now become a year-round event due to its resonance with the public and its great cost efficiencies.